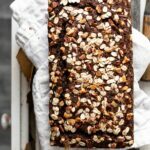 Chocolate Banana Oat Bread, hearty and healthy twist on the traditional banana bread. Sweetened with maple syrup and a sprinkling of crunchy nuts. Whisk together dry ingredients into a small bowl. In a separate bowl stir together wet ingredients. Add wet ingredients into dry ingredients. Pour into parchment lined loaf pan. Sprinkle oats and nuts across the top. Bake at 350 F for 45-50 min until toothpick comes out clean.